Rock Paper Lizard: An odd duck. 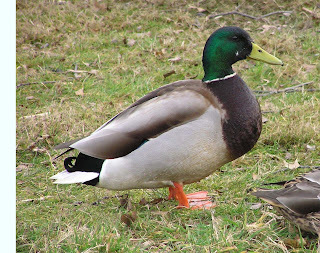 which is not unexpected; Mallard hybrids are relatively common. 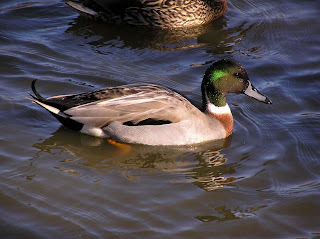 In parks and sanctuaries there can be a surfeit of male mallards, some of which will breed with females of other species. The bird in question is an example of perhaps the most frequently occurring hybrid, at least in this region, Mallard X Northern Pintail. From the pintail gene-pool, the hybrid picks up a lengthened tail plume (although much shorter than in a pintail, and slightly curled), a more slender neck than in a mallard, a broadened neck ring that is incomplete and arcs up the sides of the neck, a brownish face, and a grey-black two-tone bill, instead of the yellow of a mallard. Mallard X Northern Pintail hybrid male. Cool! I have never noticed one of the hybrids before. Next time I see a flock of mallards, I'll have to pay closer attention.